If you enjoy goldfinches and happen to feed thistle or nyjer seed to attract them, there’s more you can do to accommodate these little songbirds. Adding nesting material near your thistle bird feeders will entice them to nest nearby. This means a good chnace of seeing more finches and especially fledglings. Although Goldfinches don’t use birdhouses, they will nest in hedges or trees. They are the latest songbird to nest and breed with their season running from June to September. (So there’s still time). The House Finch, who also feasts at thistle feeders, has 1 to 3 broods per year, so they stay pretty busy building their nests – which can be found just about anywhere. Check the Boston Ferns on your front porch before drenching them with water! Commercial nesting materials are available, but you can make your own fairly easily. Using a mesh bag (from the produce section of the grocery store) start collecting dryer lint, yarn strings, pet hair, moss, and small twigs. Gather materials and tie off bag to hang from a tree branch. Your birds will be grateful for the easy pickings! The American Goldfinch is adored by many backyard birders, mostly for their vibrant yellow plumage and sweet song. With a gentle disposition, they tend to shy away from a crowded thistle feeder, whereas most birds become aggressive and fight for food. You can alleviate this problem by adding extra feeders. With the use of thistle, or nyjer socks, it is very inexpensive and effective to accommodate more finches. The thistle socks are available in different sizes, and best of all, cost only a few dollars (usually under $5.00). No cleaning required, basically they are meant to be disposable after becoming worn or tattered. They allow for cling-type, all over feeding as opposed to perches, so the whole feeder is actual feeding space. Thistle socks are available in white mesh, black, even festive holiday colors! 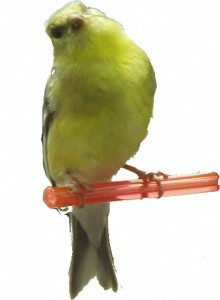 Eliminate the competition for food and attract more Goldfinches with the use of this innovative thistle feeder. If you adore the vibrant yellow plumage of Goldfinches, it’s best to keep thistle feeders out year round. Thistle seed, also called nyjer is enjoyed not only by Goldfiches, but Indigo Buntings and Pine Siskins relish this seed too. One of the benefits of thistle is that it will not germinate, so there are no worries of sprouting weeds below your feeder. Another is that Goldfinches will sit at your feeder pecking seed after seed (to feed their brood) so it’s easy to view the charming songbirds. Both their song and disposition make the American Goldfinch a favorite among many backyard birders. A common drawback to the very long, tubular style thistle feeders is that seed gets compacted at the bottom and tends to draw moisture if always filled from the top. Some feeders can be filled from the top or bottom. Remember to dump old seed and keep feeders clean. The three-tube thistle feeders also tend to distribute the seed more evenly, thus eliminating the problem of packed seed at the bottom. A Squirrel Proof Bird Feeder – Beware of Imposters! The war with squirrels! We’ve all been there and have spent so much time and effort trying to outsmart the furry critters. There’s even been books written on the subject. If you enjoy backyard birding, you’re likely all too familiar with this scenario. There are hundreds of squirrel proof feeders on the market today, and some work better than others. Many claim to be a squirrel proof bird feeder, but they just don’t stand up to the promise. In my yard there are probably too many bird feeders, and definitely too many squirrels! I don’t mind feeding the squirrels too, but I used to cringe when they managed to empty a bird feeder. Over the years I have learned the importance of baffles. 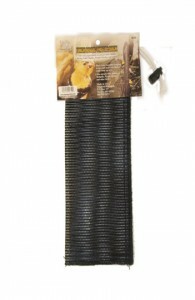 Squirrel baffles, when used properly work very well to keep pesky critters from raiding birdseed. By using them, you can create squirrel proof bird feeders that really work – for minimal cost and maximum performance. The thing to remember, is a squirrel’s ability to jump eight feet sideways and four feet high. The baffles must not be placed too close to any possible “launch sites” for squirrels. Nor can they be too close to the ground. If your feeder is hanging, the baffle would be above, its circumference being one-third larger than the feeder. If there is a pole mounted feeder, the baffle would need to be placed below the feeder, at least four feet from the ground. With a little bit of effort and minimal cost, you can save money on seed, and save yourself much aggravation! This is the Totally Green Birdhouse kit and it’s made from 100% recycled paper, that has been laminated into a strong board! 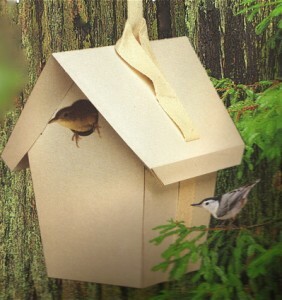 Like traditional wooden birdhouse kits, it attracts wrens, tufted titmice, chickadees and nuthatches. The airy and innovative weatherproof design is totally biodegradable after the nesting season. It’s fun to assemble, by folding two die-cut pieces of board that fit together ingeniously. Then kids and/or playful adults get to paint and decorate the bird house any way they want. You can be creative, and provide wild birds a much needed nesting site, and shelter at the same time. Looking for a fun summer project to do with the kids? Birdhouse kits fit the bill perfectly, as once the project is complete, you actually have a useful, functional item that will last for years. Wood birdhouse kits are available in more than just houses too. Bat houses can easily be constructed, and teach kids about the tiny creatures as well. Why do so many folks erect bat houses in their yards? One of the main reasons is natural mosquito control…it works great. The wonders of nature, no chemicals needed. The kits are also available in bird feeders. Easily constructed, great family project that leaves you with a functional, useful item to last for years. If kids are introduced to the wonderful world of birds, they may actually enjoy the hobby, and learn so much about nature. Stewardship of our planet is more important today than ever before…help feed the birds! Sustainability is where it’s at today, we see it all around us via products in every realm of life. Recycle-Reuse! Recycled birdhouses and bird feeders have made their way into the marketplace too, offering a fabulous option to their wood and plastic counterparts. Most have guarantees to never crack, split or fade, and they keep plastics out of our landfills, and trees in the ground-where they belong! 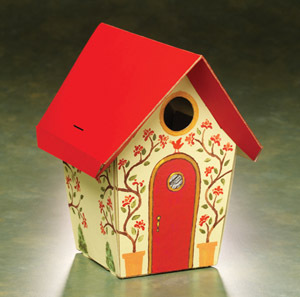 Even recycled birdhouse kits are available for those who wish to build their own. The kits make great projects for church or kids groups, even family projects. Whether a birdhouse, or bird feeder kit, it’s a great way to teach today’s kids the mega-importance of stewardship! Over time, wooden birdhouses tend to weather, and if you happen to have pesky squirrels who like to gnaw on wood…well, this doesn’t help much either. The new recycled birding products are constructed to last a lifetime, and most come with manufacturer’s guarantees to never crack, split or fade. They may cost a few dollars more, but the investment is well worth it. Aside from a durable, long lasting product, you’ll be helping to keep plastics out of landfills, and every little bit does matter! The recycled blue bird house pictured above is made from 43 plastic containers, is of the highest quality and approved by the North American Bluebird Society (NABS). Look for this symbol when purchasing a bluebird house to ensure it meets proper standards for bluebirds. Blue Bird Houses…Built to Last a Lifetime! Beautiful and classic, architectural style blue bird houses are coveted by many backyard birders. They just look so darn good! You may have seen these before—maybe not. These classic, architectural bluebird houses are very different from their wood version relatives, although they may look the same. These blue bird houses are constructed of vinyl, just like vinyl siding on real people houses! They will NEVER crack, split or fade, a guarantee made by the manufactuer. Of the highest quality, your bluebirds will be proud to call this home.